ARUGULA: an aromatic, bright green, salad green with a peppery mustard flavor; rich in iron and vitamins A and C. See Week 3 newsletter for usage and storage tips. GENOVESE BASIL: As usual all shares will receive basil this week once again, an herb with sweet, spicy, shiny, green leaves. We supply it with root attached, so it will last up to a week or 2 when stored in a jar, vase, or glass of water on your counter or table top. YELLOW BEANS (Isar): beautiful, yellow, fillet bean with excellent flavor. See Week 10 for usage and storage tips. BROCCOLI (Wed. members only): deep emerald green, tiny buds that are clustered on top of stout, edible stems; known as an anti-cancer vegetable. See Week 6 newsletter for usage and storage tips. CABBAGE (Flat Dutch—Fri./Sat. Members only): 7-inch deep, solid, flat heads, sweet cabbage with green leaves that are tender and crisp with a good amount of vitamins A and C, calcium, potassium, and magnesium; good for storage and making sauerkraut. See Week 6 newsletter for usage and storage tips. CARROTS (Nutri-Red): unique, coral-red roots, best cooked to deepen the color and improve the texture; excellent carrot flavor for stews and vegetable dishes). See Week 10 newsletter for usage and storage tips. SWEET CORN (Potawatomi): yellow kernels with excellent sweet flavor. * We don’t treat our corn with pesticides, so you may find some ear worms enjoying the corn too; just break off the damaged part and cook the rest of the ear. See Week 12 newsletter for usage and storage tips. GARLIC: a bulb of several papery white cloves; believed to help in fighting infections, cancer prevention, bolstering the immune system, etc. See Week 5 newsletter for usage and storage tips. NO SMALL HERB BUNCH THIS WEEK! Most of our herbs are taking longer to grow back, so we are letting our smaller patches of herbs recuperate, but you will receive Genovese Basil this week. ONIONS (Red Zeppelin): medium to large, globe-shaped bulbs with deep red color and will store for six months or more under proper conditions. See Week 10 for usage and storage tips. HOT PEPPERS: You will receive Serrano (cylindrical fruit with excellent, very hot flavor; usually eaten fresh green in sauces, condiments, or as a key ingredient in fiery Mexican dishes) or Jalapeño (small and conical hot chile pepper, ranging from green to red; used commonly in Mexican or southwestern cooking) or Red Ember (fruits are sweet with moderately warm heat for a cayenne pepper. “Pepper heads” can eat Red Ember fruits whole, while others craving a touch of heat can slice it thinly for salads. Makes excellent powder or flakes; also nice for hot sauce). See Week 16 newsletter for usage and storage tips. SWEET RED PEPPERS: You will receive Carmen (6 inch long, tapered fruit that ripens from green to a deep “carmine” red; sweet taste in salads and when roasted and fully red-ripe), Red Knight Bell (big, blocky, thick-walled, green-to-red pepper with sweet flesh), or Lipstick (sweet, cone or heart-shaped peppers with juicy, thick flesh; delicious in salads and salsas, but also great for roasting). See Week 14 for usage and storage tips. POTATOES: You will receive Yukon Gold (yellowish brown skin with yellow dry flesh and pink eyes; long storage and good tasting) and Mountain Rose (rosy-skinned inside and out, these versatile, all-purpose spuds are deliciously moist, but not waxy textured; extra nutritious, and high in antioxidants; excellent baked, mashed or fried). See Week 7 newsletter for usage and storage tips. RADISHES: You will receive Pink Beauty (pink-colored root with mild, spicy flavor) or Bacchus (stunning, purple, round radish with white inner flesh. Very good flavor and not too hot). -How to store: refrigerate in plastic bag/damp towel for 1-2 weeks. TOMATOES: You will receive Geronimo (newer variety but already one of the most widely used beefsteak varieties; fruits are very large, firm, nice red color and good taste) and Tiren (classic San Marzano shape developed in Italy; produces meaty fruit; great flavor for sauce). See Week 9 newsletter for usage and storage tips. WATERMELON: You will receive Sunshine Yellow (8-10 pounds oval-rounded fruit; green-striped shell with bright yellow flesh, which is brittle, juicy, and very sweet) or Dark Belle (dark-green skin, bright-red flesh, oblong 5-7 lb. fruit with thin rind, and very sweet flavor). See Week 11 for usage and storage tips. WINTER SQUASH: Everyone will receive Spaghetti Squash (3-5-pounds, pale yellow, oblong, smooth, medium size, only mildly sweet with “spaghetti” (stringy) flesh). -How to use: Slice in half, scoop seeds out and bake with a little water in baking pan at 350 degrees for 40 minutes or until tender; bake like squash or boil and fork out the flesh, topping the “spaghetti” flesh with your favorite sauce; mildly sweet). -How to store: Keep for several months (depending on the variety) in a dry, moderately warm (50-60 degrees), but not freezing location with 60-75% humidity; will also store at room temperature. 1. ENDING SUMMER CSA DATES: The end is drawing near. This is just a reminder that our summer shares are ending in just a few weeks. That means Oct. 10 (Wed.), Oct. 12 (Fri.), and Oct. 13 (Sat.) are the last distribution days for our Summer Shares. 2. FALL WORK PARTY/END-OF SEASON POTLUCK will be this coming Sunday, Sept. 23, between 1-4 P.M. Our end-of-season potluck will also be at this time, so please bring an hors d’oeuvre, snack, or refreshment to pass. Members are invited to bring family and friends to help harvest squash, pumpkins, and potatoes before the first frost. You may also come just to enjoy the farm and walk around to see the produce and the animals, listen to our guest local musician, or just eat at the potluck anytime between 1 and 4 PM. All who come will be able to take something home with them, such as a pumpkin, a winter squash, and a flower bouquet. 3. 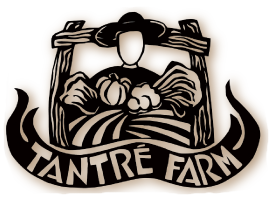 COOKING CLASS with Chef Allison on October 3 from 6 to 9 PM: Tantre’s Farm seasonal farm shares allow for so much creativity in the kitchen. But don’t be stumped by all of the possibilities! Personal Chef Allison Anastasio Zeglis, from www.lastbitechef.com will show you how to approach a CSA box to cook for yourself & your family. Get hands on experience preparing a meal using fall produce in a way that you can recreate in your own kitchen. Then stay to enjoy a delicious fall produce inspired meal!Please register with OCTOBER COOKING CLASS in the Subject Line and your NAME, PHONE, and EMAIL ADDRESS. Please bring $15/person, but if financial difficulties, please let us know. More details coming! 4. “EXTENDED FALL CSA” SHARE REGISTRION IS OPEN: This 3-week share runs from Oct. 14 through Nov. 3 for $108 (this amount has been corrected from last week, which incorrectly said $110!) celebrating all the bounty of the fall vegetables! The link for online registration is http://tantrefarm.csasignup.com . Please sign up by Saturday, Oct. 13, so you won’t miss any of those 3 weeks of produce. Please go to our website for more information. We are prorating these shares as well, so if you need to miss a week of the Extended Fall CSA, just send us an email, and we will register you for the weeks you will receive a share. Hope to share more of this abundant fall harvest with you throughout October! Tell your friends and family!! Due to outside exposure of potentially cold-damaging temperatures in October, we will not have Fall Shares at the Chelsea Farmers Market or at MOVE, since we have no way to protect these shares, so please find alternate pick up locations. All other sites are the same. 5. HARVEST KITCHEN PREPARED FOOD CSA: Also, be sure and check out Harvest Kitchen’s website at http://harvest-kitchen.com, if you’re interested in fresh, delicious, farm to table meals delivered right to your door or some other convenient location. Just check on the various meal plan options or gift cards. 6. U-PICK AVAILABLE: Please call ahead if you plan to pick on other days besides Farm Distribution Days (Wed. and Fri.), so we can make sure someone is around to help you. –U-pick Tomatoes – many tomato varieties are ready for picking. Members–$0.50/lb. Nonmembers $0.75/lb. –Already Picked Tomatoes – available for $0.75/lb. We will have half bushels at the farm, the Hub, and the market for $15. –U-pick Flowers – You may pick 1 bouquet of 16 stems per household for “free” in the u-pick flower garden on the farm. Extra bouquets – $4. 7. PLASTIC OR PAPER GROCERY BAGS NEEDED, if you would like to donate some to the farm or at markets. We are running low. NEW! Argus-Packard (Sat.) (limited site)–10 A.M. To 12 P.M.
We are looking forward to the Fall Equinox coming up at the end of September. This beautiful summer is coming to a close and the door to autumn is ready to open as the abundance of tomatoes, watermelon, and sweet corn begin to diminish, just as the fall carrots, squash, cauliflower, and cabbage are surging from all the fields of the farm into a bountiful fall harvest. As we fill the canning jars and freezers with the last of the summer crops, we are simultaneously preparing to fill the root cellar and dry squash room full of the fall harvest before the first hard frosts arrive. The green grass along the path to the barn has faded to a dull, light brown and the seeds are flaking off in the last gusts of summer. The bees, hornets, and wasps are gathering up their pollen and protein for their winter sleep hibernation. As continually active as this summer has been, the winter we look forward to will be a time of contemplation and rest. Preheat oven to 375 degrees. Halve the squash and scoop out seeds. Bake face-down on oiled sheet until it is easily pierced by a fork, about 30 minutes. Let stand until cool enough to touch, then scoop out pulp and place in large bowl. Meanwhile, heat butter and saute onions, garlic, and mushrooms with herbs, salt and pepper. When onions are soft, add tomatoes and continue to cook until most of the liquid evaporates. Stir this mixture into squash pulp with remaining ingredients except Parmesan. Spread into buttered 2-quart casserole. Top with Parmesan. Bake uncovered for 30-40 minutes.